USB drive data restoration software is compatible with Windows and supports all type of USB drives like USB pen drive, Flash drive, Flash disk, Thumb drive, USB zip drive, memory stick, USB key, magic stick, pocket drive, Geek stick. This is GUI based user friendly read only software with excellent features. Tool provides recovery of all corrupted, formatted or deleted files folders of USB drive disk and storage like 64MB, 128MB, 256MB, 512MB, 1GB, 2GB and 4GB USB drive can be restored by the software. Software scans full USB drive and restores the data back on the disk. Utility fetch any missing lost damaged data files like txt, doc, xls, ppt, mdb exe zip and others from flash drive, flash disk, thumb drive, key drive and mini pen drive. Software also recovers both undetected data images and text. 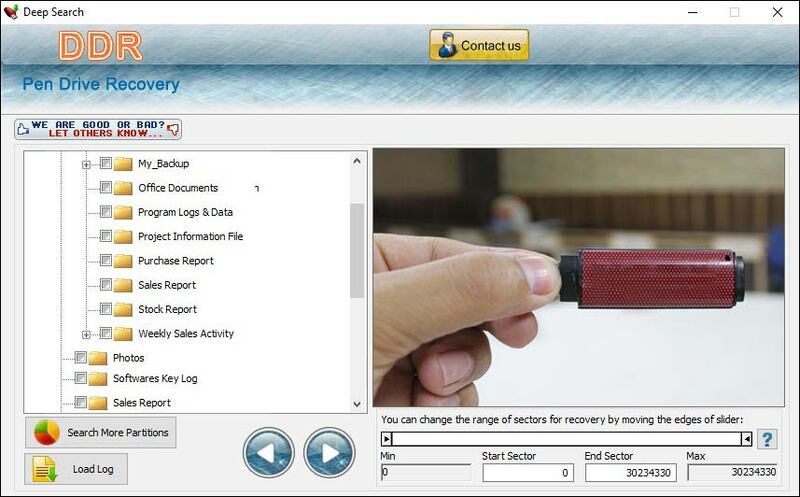 USB drive retrieval utility restores deleted files folders from Kingston, Konica, Sony, SanDisk, Transcend and other latest devices. Features:: * Utility recover all audio, video, image files like mp3, m4v, mp4, , MPEG MOV DAT AVI BMP PNG JPG JPEG RIFF GIF TIFF from USB drive. * Software is also capable to restore data when USB drive is being Re-formatted or corrupted. * Enables complete data recovery when volume is not recognized due to undetected file system, hardware and software malfunction or virus. * If USB drive pulled out without having message SAFE TO REMOVE then tool also recovers data. * When DRIVE NOT FORMATTED, message shown the system, restoration is also possible. * It detects and repair all deleted formatted audio video, picture, images and music files and restore on disk. * Software can recover USB devices like external pen drive, memory stick, key drive, flash drive, and thumb drive. * Featured with graphical user interface (GUI) and inbuilt help for easy data recovery. * All Windows operating systems are supported by software.